Several years ago Costa arrived at the house late one afternoon with a happy grin on his face. Biera. That’s possibly one of Costa’s favourite words. Fond of his beer is Costa, and we make sure to have a supply on hand. He drops in when he’s working in the area, and we have our little ritual of beer for Costa and tea for me. He’s the most cheerful man, loving to crack jokes, especially about being a Muslim. “Are you both well?” he continued, as I made ready to fetch him a beer. He darted off up the driveway towards the gate. Puzzled, I waited. Hiding something away to surprise me with is a little game of his. Could be anything. If it’s a plant or bunch of flowers he’ll keep it behind his back until he’s satisfied I’m sufficiently curious, then he’ll produce it with a flourish. He’s a great showman, is Costa, and a most kind and generous person. He came trotting back down the drive carrying a typical round Greek terrace table. 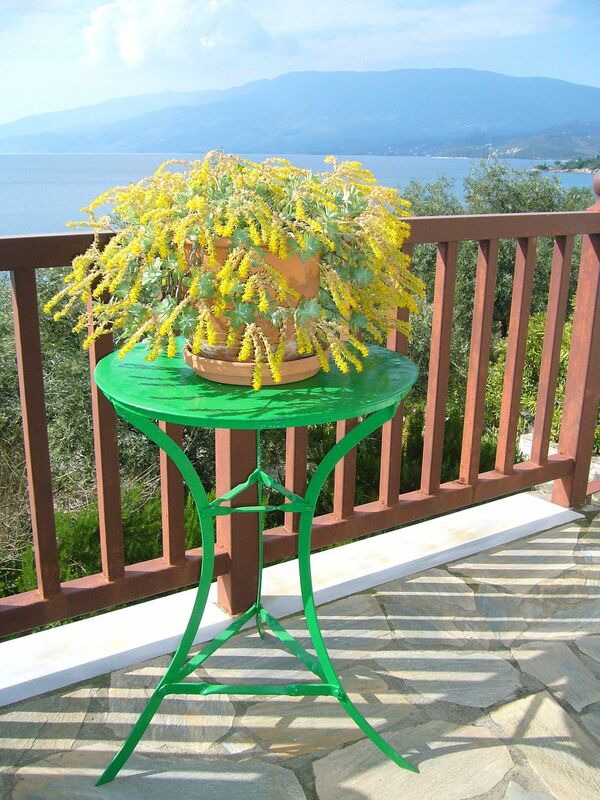 You see these classic little tables everywhere in Greece. Simple and practical they’re the stuff of picture postcards, often painted blue, set amid pots of bright red geraniums, and with an inviting jug of wine or cup of coffee atop them. They’re iconic, instantly recognizable as Greek, speaking of lazy summer days. Mind you, I’m not sure if the days of the staff who serve customers in tavernas and coffee shops are all that lazy – they run themselves ragged taking care of their customers. But the table Costa was holding aloft was not new. Its top was quite battered, what little paint left on it flaking off in a mishmash of grayish green, mixed with plenty of rust. It was charming. I loved it instantly. It reflected a great deal of age, hand wrought of thick steel and still perfectly sturdy. Bless him, he knows I appreciate the old, the unusual and most especially the handmade. We put it in a corner of the terrace where it stood proudly for several years facing Mt Pelion, often graced by a red geranium in an old ceramic pot. The winds can be very fierce across this terrace. Aelos, god of the wind and chosen by Zeus himself, doesn’t always tease gently off the sea. At times he hurls himself savagely onto the land, particularly when Zeus is having a right old spat with his wife Hera and has demanded that Aeolos do his bidding. The original geranium has been replaced many times, so vicious can Aeolos be when he decides to release the winds under his command, but the pot and the table have never yielded to him, and the table became even more weathered and dignified in its old age. “You need to let me paint that,” Costa would assert, frequently, over the years. “It’s old and people will think you are very poor and can’t afford to buy a new one.” Appearances matter to Costa. Costa would merely sniff, but one day, after a couple of beers, he did reveal he’d found it dumped in a gully with a pile of builder’s rubble. It could have come from anywhere, but it certainly has had a long life. As you know, we were gone almost all of last year. Costa and Freddie were absolute stars, taking it in turns to come down from Albania to look after our numerous pets and keeping everything going here. Costa isn’t usually in Kalamos during the summer because there’s not much work. The winter months are his busy ones as it’s then that the olives are harvested, the trees pruned and the lands tidied up. So he had lots of time on his hands, and he used it well, doing all kinds of little chores about the property. Have you read Roald Dahl’s wonderful story “The Parson’s Pleasure”? If not, you’ve missed out on one of his typical pieces of black humour. This tale involves the destruction of a genuine Chippendale commode, and yes, you’ve guessed right. Costa channeled Dahl, of whom he’s never heard although Dahl’s delicious stories must surely have been translated into Albanian. No, Costa didn’t saw the legs off my beautifully distressed table, my gorgeous piece of shabby chic, but he did finally get his way. He painted it. He went to all the trouble of having someone buy him the paint, and he painted it. Bright green yet. Rather a startling bright, glossy green. He couldn’t wait to show it to me when we returned. I confess I gasped. I was stunned, but Costa was thrilled, assuming I was delighted. Oh dear. No way could I have hurt his feelings. Never could I do that. So I told him it was perfect, absolutely perfect, I praised him for his thoughtfulness. And Costa beamed. He’s so proud of it. He’s overjoyed to have made me happy. And yes, it’s absolutely not what I wanted, not at all, but you know what? It is perfect. Absolutely perfect.